It is now done...contract signed last night and bulid to start hopefully week after next. 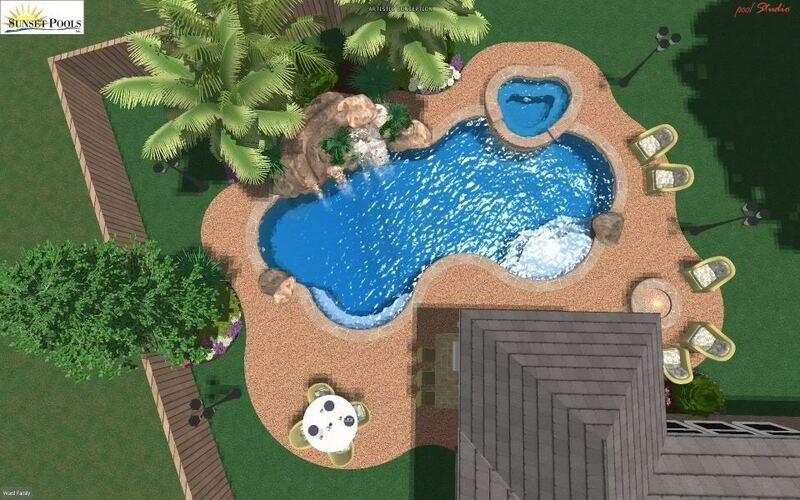 After all the excitement of the design process and the idea of having a pool installed, I find myself a nervous wreck in regards to the cost. I guess once the hole is full of water and the kids are laughing and playing...I will know that it was all worth it. I will continue this post with pictures as the process begins. I suppose I will use it as my journal of ups and downs...if no one else reads it, at least I have a place to express the good and bad of the build. I will post a pic of the final design once I get it from builder. Guess what... tomorrow will be filled with regrets. Don't sweat it. It'll get worse. While you wait... tell us about what you're building. DITTO! and welcome to frustration followed by (what I am told will be) complete JOY! and YES, it truly helps to keep your sanity to post any gripes, frustrations, and problems here. There is someone here that has been through "THAT"! What are your decking, coping, interior finish choices? We had decided on midnight blue pebbletec, then Adam talked us into having the beach entry white pearl pebbletec. I can't wait to see how it turns out. Man, i would have loved to have done one of those gunite slides, but due to our easement restrictions we couldn't without greatly reducing our pool size. Hey KTdave...I assume it's ok to call you Dave! We are still on the fence on the interior finish...may use primera stone oe Pebble Sheen...one of the toe, but we are back and forth day to day and Adam said we dson't have to lock in our decision yet. THe decking is just going to be the Pebble Deck...it works for us and will work well with all the stone, plus it's good on traction and with 3 of my own kids and 27 other kids on my street, we needed something not too slippery...I wanted stamped concrete, but the cost for that would have eliminated the gunite slide!!!!! My kids keep asking...when is the tractor coming to dig....they want this thing done now! I know this rain has you going crazy...I am sure you are ready to get things finished and start swimming...hopefully things will clear up towards the end of the week for you. Very nice looking design, Ward. Not too different than the one we're trying to build. Ours won't have the nifty waterfall and slide though. Similar size though, and spa with wide spillover. Enjoy your project. Might as well. When its done, all you can do is swim and maintain it. Looking forward to the swimming and maintaining believe it or not!!!!! 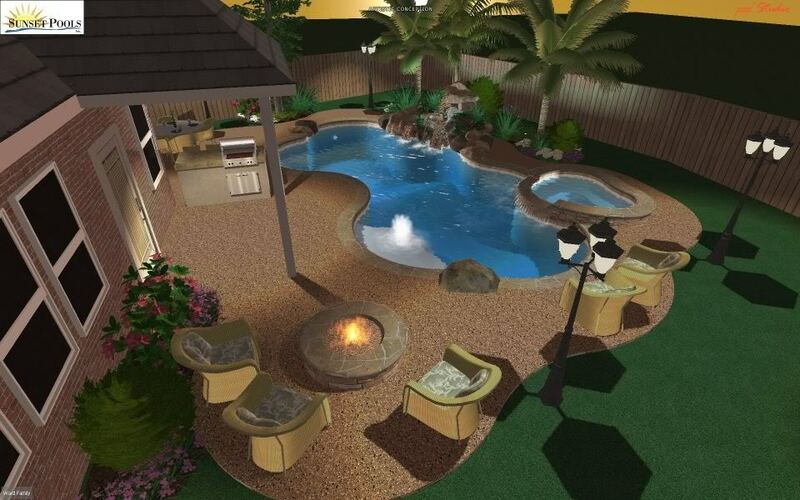 OK, final design pictures...hopefully close loan this week and have HOA approval by first of next week. I am told that excavation can begin immediately after HOA says its a go...let's hope the rain moves out of Houston and allows us to get started. YES! I'm pulling out the last three of my Charlie Brown hairs that I have left. This rain needs to quit soon! Thanks for the sentiments! Your final schematic looks very cool, I wish I had room for one of those slides. Looks like the dig will finally start on Thursday or Friday...oh yeah, unless it rains. I hope you don't mind, but can you tell me roughly how much that pool is costing you? Thanks! Looks great. Make sure to snap some photos along the way and post 'em. 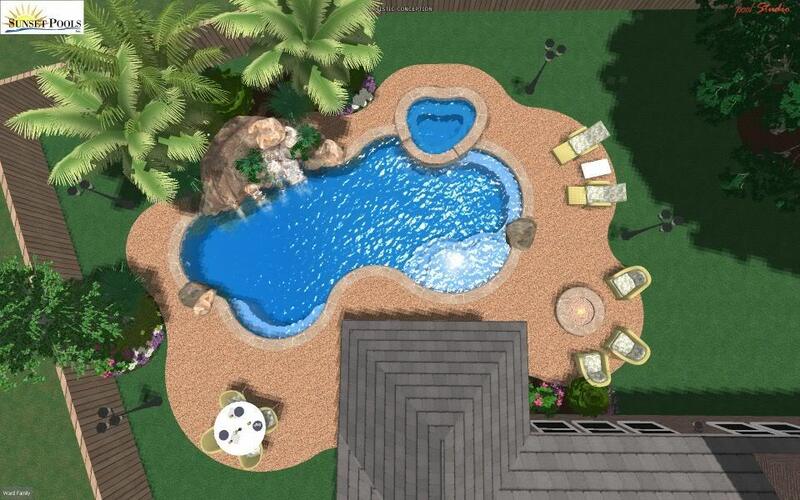 Pool was outlined today, tree removal tomorrow and excavation on Friday. With the tree removal, 44' cross fence and that waterfall, we are at 65k.....YIKES hurts to say. not that it helps justify the cost....but the landscaping is in that price also!!!! You'll be so glad that you are having them do the landscaping. I'm starting to lose a little sleep over the lawn rehab job I have before me. Just something I didn't think about before we started. Actually, in my naivety, I didn't think the yard would be torn up like it is. Your plans look great - didn't it make it easier since you can really "see" what it will all look like! I think having landscaping included DEFINITELY makes the price a LOT more bearable - we finished our pool last summer and this year are still working on landscaping - back yard is nearly done -but we had NO idea how much damage would be done to the front yard - enough that since we have to replace the front walk and all sprinklers we might as well completely redo the yard...which is a $$ number we didn't fully plan for! Our PB has been great with my design changes...very patient. 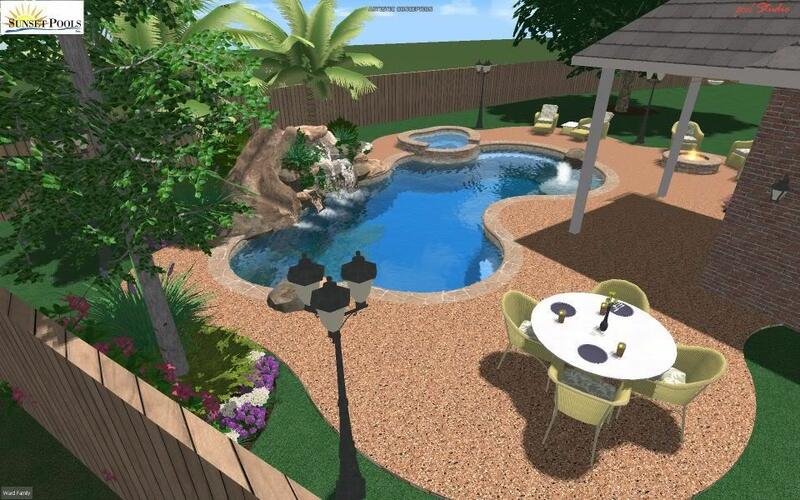 I think I could redesign this pool 100 times and still find something new to change!!!!!! Anyway, tree removal was supposed to happen today...tree guy held up on another project....so looks like no excavation tomorrow . We leave on Saturday to go do some R & R on Petit Jean Mtn in Arkansas (who vacations in Arkansas????) , so I was hoping to see the hole dug before we left, but doesn't look promising. Anyway, as things progress, I will post pictures. The outline of the pool is hard to see in the pics I took, but I will post as trees get cut and the dirt gets dug!!!!! OK, so out of town heading to Arkansas, but fun stuff happened as we were leaving. Excavation took place today.